Launceston has more quality rock within 90 minutes drive of the city than most other major cities in Australia. With over 1800 routes at 12 venues all reachable in 90 minutes drive or less, it certainly makes for a great climbing holiday. The Northern Tasmanian landscape provides an astonishing variety of climbing experiences, all within a relatively small geographical area. In central Launceston there are 850 routes in Cataract Gorge and further upstream. In the North Esk river just 10 minutes from town is 300 routes in another spectacular gorge. Then there is Australia’s premier crack climbing area at Ben Lomond, 45 minutes from the city. There are multi-pitch routes on big mountain crags such as Mt. Roland and Mt. 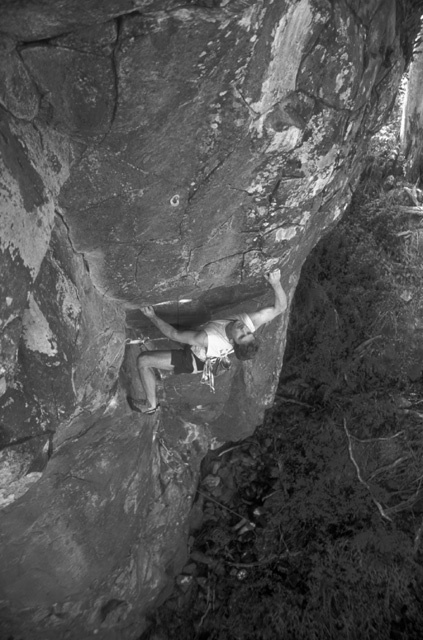 Blackwood, whilst Hillwood is the largest and most accessible sport climbing area in the state. You can jam perfect dolerite cracks at South Sister and Devils Gullet, crank steep quartzite by the sea at Sisters Beach, or balance your way up beautiful sandstone arêtes at Blackwood Rocks. The amazing 200m dolerite face of Bare Rock at Fingal offers scary run-out face climbs, classic well protected moderates like MacDonagh, and Tassie’s longest multi-pitch sport route called Sapphire Rose. Then you have the immaculate granite of Killiecrankie on Flinders Island, an Arapilesian style crag on an island paradise, just a short plane ride from Launceston. For those interested in a climbing holiday and aiming to pack as much varied climbing as possible in a short space of time with the least amount of travelling, its hard to beat Northern Tasmania. This article outlines the essentials for planning a trip to the region. The most economical way is to travel on the Spirit Of Tasmania ferry from Melbourne and bring your vehicle. Fares are about $140 one way in the peak season and less in the off season. Alternatively, fly to Launceston and hire a vehicle. Launceston is the largest city in Northern Tasmania and is central to most of the crags in Tasmania. The Launceston Backpackers in Canning St is recommended (6334 2327). There is also free camping at Egg Island Point 3km upstream from Hillwood. The weather is generally mild with summer temperatures rarely exceeding 30 degrees, and winter an average of about 14 degrees. Climbing is possible all year round except at the alpine venues, unless you like snow and ice. You should purchase a national parks pass to allow multiple entry into the parks. Hillwood : The largest sport climbing area in Tasmania, just 30 minutes from Launceston and with 145 bolted routes 5 mins from the car, this is a place you’ll retreat to again and again. Twenty five distinct crags provide a great variety of climbing from roofs, steep face climbing, vertical crimpfests and slabs, catering for grades 15 to 28. The cliff is on private property and first time visitors must ring Gerry Narkowicz (63301435) to arrange access. Camping is at Egg Island Point, 3km upstream from the cliff. For directions and route descriptions, see the new guide to Northern Tasmania out in late April. Cataract Gorge: Over 300 routes literally in central Launceston providing crack climbing and some sport climbing on quality dolerite up to 25m high. See Robert McMahon’s guide `Cataract’ for details. South Esk: All the routes in the next 5km upstream from Cataract Gorge, some 550 climbs. Superb crack and sport climbing in a backyard wilderness just 10 minutes from town. Guidebook: `South Esk’ by McMahon and Narkowicz. North Esk: 300 routes on 12 cliffs in a spectacular gorge 15 minutes from town on the Ben Lomond road, mostly quality trad climbing with some sport routes. Riverbend is the pick of the crags. Guidebook: `North Esk’ by Robert McMahon. Ben Lomond: Australia’s premier crack climbing venue about 45 mins drive from Launceston. 100m perfect parallel cracks on dolerite columns. Guidebook is currently being written. Contact Gerry Narkowicz or Robert McMahon for route information (63301435). Accommodation at the climbers hut, 100m before Carr Villa scout hut in the bush on the left where the intermittent creek flows. BYO water and firewood. Fingal Valley: Bare Rock is a 200m high dolerite face at Fingal about one hour, 15 mins drive from Launceston. There are classic big trad routes such as MacDonagh (17) and Fionn McCool (19) plus Tassie’s longest multi-pitch sport route Sapphire Rose (22). Camping at the cliff. Good for a days climb en route to Freycinet. South Sister at St Marys is also recommended providing 20m versions of Ben Lomond parallel columnar cracks. 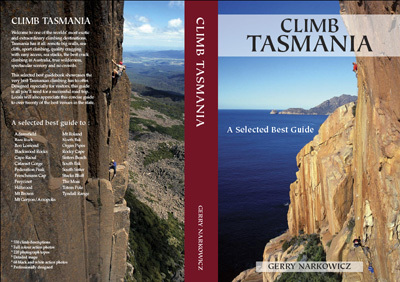 See the new guide to Northern Tasmania for details. Mt Blackwood: One hour from Launceston is a lovely sandstone sport climbing area with 30 routes recently developed. 15-20m faces and arêtes on solid sandstone providing delightful climbing wth outstanding views. On the summit of the mountain is a 90m dolerite crag providing quality one and two pitch routes just 30 mins walk from the car. See new Northern Tasmanian guide for details. N.W Coast: The most popular cliff in this area is Sisters Beach providing a dozen good sport routes and some quality trad lines on steep quartzite by the sea about 30 mins west of Burnie. Rocky Cape is another 30 mins further west and provides quality trad climbing on quartzite in a seaside setting. The other recommended crag is Mt Roland near Sheffield, primarily for its classic ridge route called Rysavy Ridge (12), a 350m ramble on quality conglomerate. See the new Northern Tassie guide for details. Flinders Island: A climbers paradise in Bass Strait. Fly from Launceston for $280 return or $380 from Moorrabbin, then hire a vehicle in Whitemark for about $60 a day. There are two main climbing areas. Killiecrankie is 30 mins drive north of Whitemark and is very similar to Arapiles in its feel. The cliffs are over 100m high and set back a few hundred metres from the sea, and the rock is perfect polished granite providing every conceivable type of climbing, mainly on natural gear. Turn off the highway at power pole no. 334 and go down the rough 4wd track to the Docks. It is recommended to camp by the car at the Docks and walk 30 mins to the cliff each day. There is a lovely campsite at the cliff but the water supply is unreliable. Mt Strzelecki is the other main area, a massive granite wall over 200m high at the south of the island. Camp at Trousers Point – Bbq’s and toilets available. It takes 2 hours to walk the steep track to the cliff. Most of the trad routes are big and serious undertakings, but the 50m sport route Into The Labyrinth (24) is well worth it. There are several good routes at Ball Rock close by, including 2 sport routes. For details to all 329 routes on the island, see the new Northern Tasmania guide, out in late April. Rest Of Tasmania: While this article has mainly focussed on Northern Tasmania, the other major climbing areas in the state are only 2 hours drive or so from Launceston anyway. The best areas are as follows: Freycinet: Superb granite sea cliff climbing on the east coast near Coles Bay. 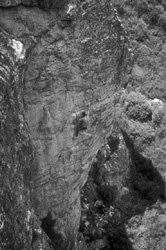 The quality of climbing and details of this area are well documented in Rock Magazine 51. Camp at Bluestone Bay above White Water wall. Tasman Peninsula: The amazing sea stacks of the Moai and Totem Pole plus the quality sport climbing area of the Paradiso are a must. Camp at Fortescue Bay about one hour south-east of Hobart near Port Arthur. See Craglets guide for details. Organ Pipes: 350 routes in a spectacular alpine setting just 20 mins from Hobart. Worth spending several days here on your road trip. See Rock Magazine 31 for details. Guidebook to the Pipes is out of print. Frenchmans Cap: Awesome 300m wall 2 days walk from the road. Tierry Le Fronde, Chimes of Freedom and Sydney route are the best routes under grade 20, while the Lorax (20) is getting rave reviews. Allow 5-6 days. See Rock magazine guide. is due for release in December 2005. It will be the guidebook of choice for climbers on road trips to Tasmania, having only the best cliffs and 550 classic climbs. Locals will also appreciate this concise guide to all the best cliffs when climbing in different parts of the state. Tasmanian Climbing - Jonathan Nermut's Tassie pages.